The discovery of an ancient piece of aluminum is being hailed as evidence that aliens visited Earth 250,000 years ago. The strange object was found in 1973 by builders working on the shores of the Mures River not far from the central Romanian town of Aiud but details of the discovery were never made public at the time because it was pulled out of the earth in communist Romania in 1973. Now tests at a lab in Lausanne, Switzerland, have revealed that the fragment of metal is made of 12 metals and consists of 90 percent aluminum which is 250,000 years old. The initial results were later confirmed by the lab in Lausanne, Switzerland, CEN reports. Experts were stunned to find out that the piece of aluminum has concavities that make it look as if it was manufactured as part of a more complex mechanical system and although they have questioned the 250,000 year determination, speculating it to be between 400 and 80,000 years old, but even so, it’s still much too early for mankind to produce aluminum. 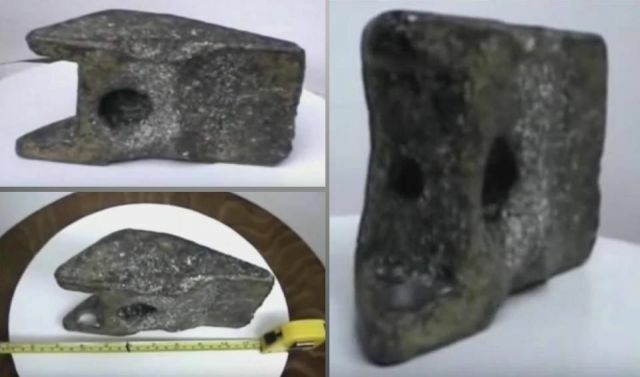 "Lab tests concluded it is an old UFO fragment, given the substances it comprises cannot be combined with technology available on Earth," said Gheorghe Cohal from the Romanian Ufologists Association. yes. Its a tool head. Put it on the end of a stick, and you'll understand. Ive no problem with the time travel notion.